reading – Escape Reality, Read Fiction! I realized that I spend a part of Sunday planning the books I’m going to review during the week. It’s sort of a plot, what goes where, and why centered around the publishing schedule. Everything new is released on either Monday or Tuesday. It’s kind of like the law of gravity, without the splat at the bottom. I also looked around and discovered that there wasn’t a really good place to stick in some of the “why” about the stuff I read. Or some of the extra added attractions, like my mad scramble to read books 1 and 2 (and occasionally 3, 4 and 5) of a series in order for book 6 to make sense. More on that later. I get lot of my books from Netgalley, but not all of them. Authors are starting to ask me to review their books. That’s actually kind of a thrill. It doesn’t change my review, but it’s always nice to be asked. I also still have a lot of books in the house I haven’t read. Not to mention what my husband once described as “a metric buttload” of books that I have read. It’s all grist for the mill. 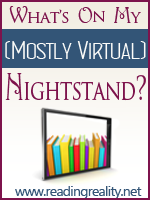 There is a “What’s on my nightstand” meme at 5 Minutes for Books that is really terrific, and I absolutely confess to having gotten my inspiration from them. 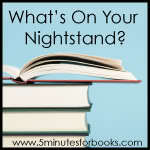 But I need to do this once a week, and the original “What’s on my nightstand” only runs once a month. I need way more organizational help than that! Also, the instruction for the original asks that you take a picture of the stack, and I would usually be taking a picture of my iPad. My TBR pile is mostly, but not exclusively, electronic. The Iron Queen and The Iron Knight by Julie Kagawa. I was able to snag a review copy of Iron Knight from Netgalley, but I had never read any of the series. I heard terrific things about it but never read any of them. Everyone knows what they are, YA urban fantasy or paranormal fantasy, depending on how you slice and dice your definitions. Urban fantasy/paranormal is right up my alley, YA or not, and I wanted to know what the fuss was about. Now I know. Iron King and Iron Daughter were fantastic, but I still have two more books to go, and the release date for Iron Knight is this Tuesday. Tuesday’s Child by Dale Mayer is a romantic suspense title I received from the author. I promised I’d review it by this Friday, so it’s definitely on my list for this week. I’ve got Darker Still by Leanna Renee Hieber from Netgalley for a November 1 release date. I requested this one because I liked the Victorian setting, and I enjoyed her story in Midwinter Fantasy. I bought her Strangely Beautiful series on my iPad, but haven’t had a chance to read them yet. Most of the time, I read ebooks, but I have a paper copy of Cast in Secret by Michele Sagara on my nightstand. For real. Why? Because I have a review copy of Cast in Ruin from Netgalley. I always meant to read the series, to the point where I bought books 1-5 in print. Moved them, too. So when Cast in Ruin came up on Netgalley, I requested it. I figured it gave me a darn good reason to start reading the series. Now I wonder why I never read them before. They’re great! But each book is 400+ pages, and Ruin is book 7. I’ll get there. And I will review it, even if I have to buy my own copy. Last but not least, A Study in Sherlock, edited by Laurie R. King and Leslie Klinger will be released on Tuesday. It’s a short story collection inspired by the Holmes canon. I know I’m going to buy it, and I know I’m going to read it as soon as it downloads to my iPad. I might as well just admit it now! There will be other stuff, but these are the ones I’m sure about. More next Sunday! I keep daydreaming about this article in Salon titled “Reading Retreats“. What biblioholic wouldn’t love this idea? A week, or two, or four (four?) in some beautiful, secluded spot, cozied up with a mountain of books. Along with room service, some place to take long walks for thinking, a nice town to visit occasionally for a change of scenery, and of course, my husband. Every one of the options profiled in the article is different. A small castle in Italy with shared cooking and shared bathrooms. A solo retreat to a monastery near Birmingham in the UK. Going to rural Bulgaria to stay at a guest house and being part of a week-long book group, reading the same books as well as staying in the same house with the group. The one I liked best with the London School of Life, where the vacation includes a customized list of books based on a pre-vacation interview and a stay at a contemporary house somewhere in the English countryside. But the real point of it all is the time. 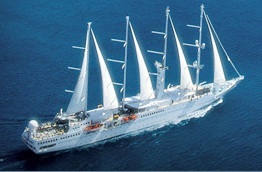 We actually did this in early December 2010 by taking a Caribbean cruise with WindStar. We didn’t think we’d be cruise people, but the concept was that it would be too expensive to be online either aboard ship or outside the U.S. territories. It wasn’t necessarily intended as a reading vacation, but it turned out that way. And we didn’t bring print books, just the Nook and Galen’s Sony. The point was to disconnect and relax. So no computer, no iPhone, no video games, no internet. A real, honest-to-goodness chance to disconnect and relax. One of the really interesting social experiments was to see the percentage of people who were using an eReader of some type. This was pre-Xmas and there were clearly more than a third, maybe as many as half of the passengers using eReaders, mostly Kindles. And this was in a demographic that clearly skewed Baby Boomer and upwards. Other passengers did approach us to ask about our “Kindles”, which was always fun, especially as neither of our “Kindles” was actually a “Kindle”. But it gave us a chance to talk about books and the ebook reading experience with interesting people. I succumbed to the impulse to bring more books than I needed. But since there is no extra weight to ebooks, for the first time this was not a problem. I still have books from that trip I haven’t read, but they transferred to my iPad just fine. I read Jeri Westerson’s entire medieval noir series. And both of Ilona Andrews’ Edge series. I was able to finish Celine Kiernan’s Moorehawke Trilogy with Rebel Prince, and indulge my romantic tastes with Bound by Honor, by Collette Gale. This is in no way a definitive list. Galen and I traded eReaders in the middle of the trip, and some of the books I read are on his Sony. I had a much easier time trying to find stuff on his reader than he did on mine! But I definitely understand the appeal of a long reading vacation. By the end of the week-long cruise, we were talking about booking the two-week trans-Atlantic crossing, just for the reading break. But for a trip that long, we would bring computers, mostly for writing. And our Xbox. And the Nook, and the Sony. And both iPads.